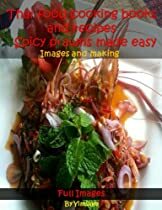 Thai food cooking books and recipes : Spicy prawns made easy by Yimsiam. Pla koong maenam in thai language or Spicy prawns. Today we will do a simple menu. Eating simple. The ingredients are very compatible. To mix the ingredients together with salad style Thailand (Hot and sour soup is called Yum or Pla in thai language). Eaten as a hors d’oeuvres as well. ไอเดียทำเงิน Thai food cooking books and recipes : Soft fried fish topped with three flavor sauce made easy.